Polls: Obama leads in N.H., tighter in Nev., N.C.
President Barack Obama leads Republican presidential nominee Mitt Romney in New Hampshire, and the two are locked in tight contests in Nevada and North Carolina, according to a new series of NBC News/Wall Street Journal/Marist polls released Thursday. Obama is ahead of Romney, 51 percent to 44 percent, among likely voters in New Hampshire. He also edges Romney in Nevada and North Carolina, but within the margin of error. “New Hampshire seems to be following the similar trends we’re seeing elsewhere,” said Lee Miringoff, director of the Marist Institute for Public Opinion, of the race in the Granite State, where Romney owns a home, and which borders Massachusetts, where the GOP nominee served a term as governor. 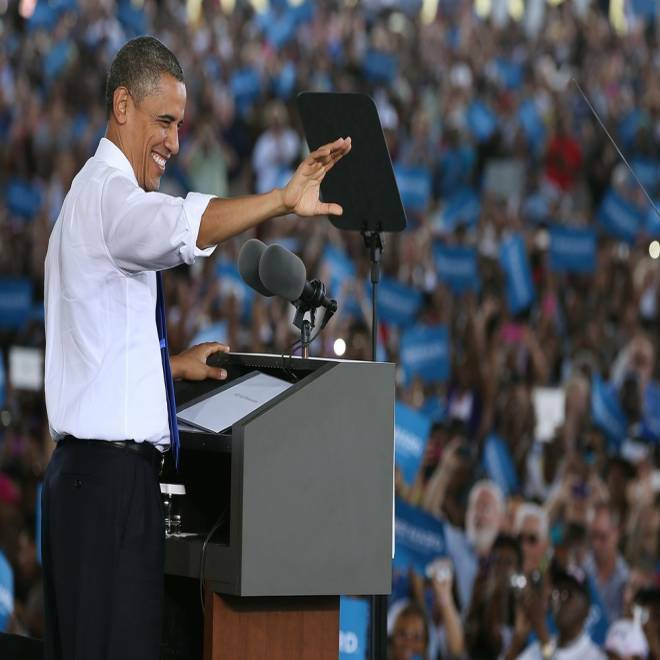 Over the past three weeks, NBC and Marist have released polls of nine battleground states – Colorado, Florida, Iowa, Nevada, New Hampshire, North Carolina, Ohio, Virginia, and Wisconsin – and all show Obama with leads, ranging from 2 to 8 points. President Barack Obama speaks during a campaign rally at the Farm Bureau Live arena, on September 27, 2012 in Virginia Beach, Virginia. The results come after a difficult one-month stretch for the Republican challenger – there was the Republican National Convention, his response to the outbreak of violence in Egypt and Libya, the revelation of a secretly-recorded videotape showing him dismissing 47 percent of the country as “victims, ” and the release of his 2011 tax returns showing he paid a 14.1 percent effective rate in 2011. 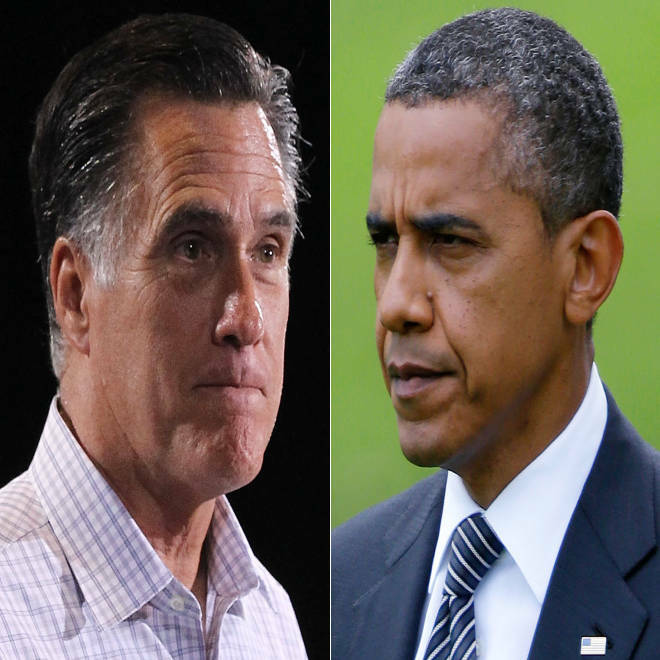 Obama’s leads in each of the states are fueled by voters’ improved feelings about the direction of the country, Obama’s handling of the economy, and Romney’s continued struggles with likability. As the presidential candidates zeroed in on Virginia, GOP contender Mitt Romney focused on the state's military ties while President Obama emphasized tax hikes on the wealthy and more government spending. NBC's Chuck Todd reports. There also continues to be a gender gap, with Obama leading with women by 20 points in New Hampshire, 16 points in North Carolina, and 11 points in Nevada. Obama is also close to his levels with white voters from 2008 in each of these states. And though there is a drop in the likelihood that young voters will turn out with the same force they had in 2008, Obama makes up for it with continued robust support from minority voters. The president’s approval rating in New Hampshire is at 50 percent, up from 47 percent in June. In North Carolina and Nevada, it’s 47 percent – unchanged in North Carolina and up a point in Nevada. President Barack Obama still faces two more monthly jobs reports before Election Day and continued unrest in the overseas markets but the latest NBC News/WSJ poll indicates a big bump up in the number of people who feel the country is headed in the right direction. Steve Rattner joins Andrea Mitchell Reports to discuss. Obama is viewed more favorably in all three states than Romney. In New Hampshire, a state where Romney’s a known commodity and campaigned heavily during the Republican primary, 52 percent had an unfavorable opinion of him. In Nevada, Romney is seen negatively by almost a majority of respondents (48 percent), while 45 percent of the state’s voters viewed him favorably. Romney’s favorability rating was net-positive only in North Carolina, though opinion on the former Massachusetts governor was nearly split. Romney’s favorable score was 46 percent; 45 percent viewed him negatively. “It speaks to the campaign strategy, which is playing with limited success of trying to raise his likability,” Miringoff said, citing the convention, Romney’s comments that health care reflects why he is empathetic, as well as his campaign ad speaking directly to camera in which he notes that he, like the president, cares about the poor and middle class. Mitt Romney holds a campaign event with veterans in Springfield, Virginia. In all three states, voters’ views of the direction of the country had improved, nowhere more than New Hampshire. The gap between wrong track and right direction back in June was 20 points. Now, it’s just 7 points. In North Carolina, there was a 4-point improvement, and just 2 points in Nevada. Nevada is still suffering from the highest unemployment in the country at 12.1 percent and its home foreclosure rate is one of the highest in the nation. In New Hampshire, voters also shifted on their views of who would be better to handle the economy. In June, Romney was favored by 4 points. Now, that’s reversed. In Nevada and North Carolina, voters continue to be split on the question of which candidate would better manage the economy. Obama retains an advantage on foreign policy in all three states. In all three states, Obama’s support among white voters and young voters is down from his 2008 bid for the presidency, though the impact might be washed out by persistent support for Obama among minority communities. Obama gets the support of 51 percent of white voters in New Hampshire, a state that is overwhelmingly white, and where Obama won 54 percent of the white vote in 2008. White support for Obama is also down slightly in North Carolina, Obama got 35 percent of whites four years ago; now he’s at 33 percent. And in Nevada, Obama is just 4 points off from the 45 percent share of the white vote he won in 2008. “He’s getting close to the share of what he got” among whites in 2008, Miringoff said. But posing a problem for Obama is that young voters’ enthusiasm has fallen off – and are less likely to turn out the way they did in 2008. “That huge turnout among young people last time isn’t there right now,” Miringoff said. But the president makes up for it with continued robust support from minority voters. Obama leads 95 percent to 3 percent among black voters in North Carolina, a state where African Americans comprised 23 percent of all voters in 2008. In Nevada, where Latinos made up 15 percent of the electorate (but 27 percent of the population), Obama has a 62 percent to 36 percent advantage over Romney. That’s narrower than the 76 percent to 22 percent margin Obama won in 2008, but he won the state by 12 points last time, a significant cushion. Additionally, there has been growth among Hispanics particularly in the Southwest, and they could make up a larger percentage of the vote in 2012. For example, in 2010, a year that favored Republicans, Hispanic voters made up 16 percent of the electorate, a larger share than in 2008. Obama’s challenge in the state will be with independents and getting out the vote in Clark County, which is anchored by Las Vegas. He won independents in 2008 by 13 points. Now, Romney leads by 12 percent. Among registered voters in Clark County, Obama had a 7-point advantage. But among likely voters, that dropped to just 2 points. In 2008, Obama won the state’s most populous county – which cast almost two-thirds of all votes – by almost 20 points. Democrat John Kerry, who narrowly lost the state to George W. Bush in 2004, won it by 5. Romney also leads among independents in North Carolina by 9 points, but that is a far smaller than the 21-point margin by which John McCain won that group. The NBC News/Marist/Wall Street Journal polls were conducted Sept. 23-25 and have a margin of error of +/- 3.1 percent for the sample of likely voters in each state.